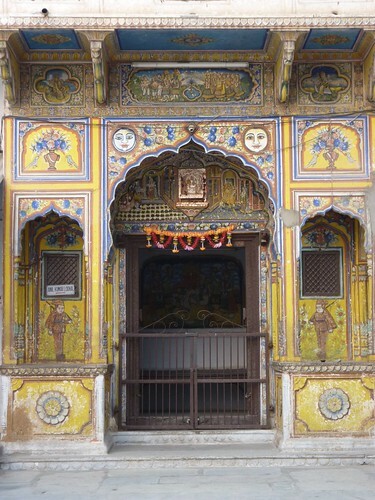 As you enter the city of Ajmer, you can ask anyone where the Lodha Haveli is, and you will be instantly guided to the 150-year-old haveli whose occupants are as well known as the haveli in which they reside. 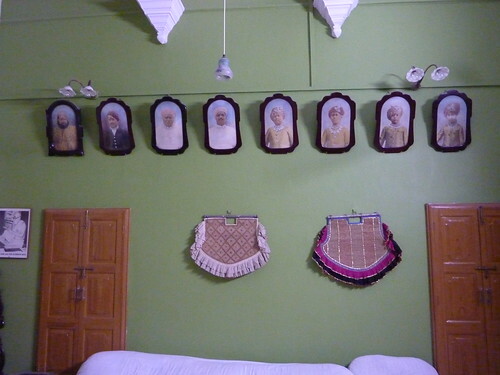 So our expectations were sky high even before we reached the residence of Mrs. Neeta (55) and Mr.Sumthimal Lodha (60), yet their Rajasthani hospitality and warmth left us speechless. It was indeed an incredible experience. And what really inspired us to feature them as a SoulMate couple was that we lost count of the number of times he made a reference to his wife, showing us her photographs and speaking about her qualities – so ardently, so passionately. Both of them are Rajasthani Jains; she belongs to the Baldota family of Mumbai while his family is one of the most renowned and revered families in Ajmer. J&P: Since both of you are from the same community, are your family backgrounds similar? She: I grew up in Mumbai in a rather cosmopolitan atmosphere while his family is more conservative. When we got married, I found their customs and lifestyle to be very different from mine, but I adjusted quite easily. He: It is true that our family backgrounds were very different. She came from a forward-looking family. You may have heard of the Baldotas; they are known as the metal kings. She: I graduated from Poddar college, Mumbai, whereas he studied in Chennai. My family was very keen that I should marry someone with a good educational qualification. He: In 1974, I completed my chemical engineering at AC Tech in Chennai after which I went to Khamgaon, Maharashtra for intensive training in solvent extraction processing. After some laboratory experiments, our team worked on processing of mango kernel to extract oil and succeeded. After refining, this is exported, to be used as substitute for cocoa butter. After processing, we get 10% oil, and 90% of the mango kernel extraction is used as cattle feed. J&P: How did you meet and where did you live? She: We were married in December 1978. Ours was an arranged marriage. In 1982, we shifted to Tadapalligudam in Vijayawada, AP. 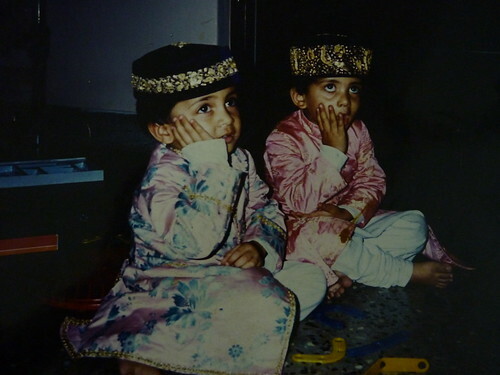 Our twin sons, Sahil & Suhel, were born in 1985. He: My family tried hard to find me a suitable life partner, but I was rather fussy. When I met Neeta, I knew she was the one for me. J&P: Lodhaji, your family lineage is meritorious. Can you describe it in a nutshell? He: In 1818, my great-grandfather’s father Hamirsinghji and his father Kawalnainji came to Ajmer from Jaipur before which they were living in Alwar. Hamirsinghji’s son Samirmalji Lodha served as Treasurer for BB&CI Railway (Metre Gauge) and this post was held by our family until 1940. From 1890 to 1898, he was also the vice-chairman of the Municipal Council and honorary magistrate. He was honoured with the title of ‘Raibahadur’. Samirmalji’s grandson Jatanmalji is my father. 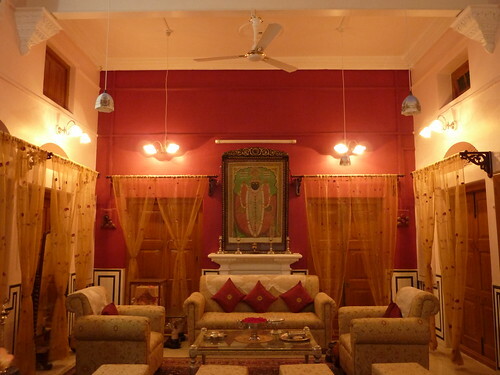 The construction of this haveli started in 1850 and since then, this has been our ancestral home. J&P: Is this where you grew up? He: No, I grew up in Chennai where my parents were staying. But in 1993, all of us decided to return to Ajmer to manage our huge properties. I am glad I chose to come. J&P: Can see that you are truly glad for that. Can you name one tradition that you truly cherish? He: In olden days, the royal families (Rajwada) would get independent cremation grounds. Our family was bestowed the same honour and we have an independent cremation ground which is situated over acres of land. For me, this place is like a temple. I come here ever so often, specifically on amavasya (new moon) and spend time in silence. It is here that I find a great connection with my history. Whatever I am today is because of the blessings of my elders. She: In fact, it is a family tradition that every bride who comes into our family is first taken to this place. J&P: Many people tell us that you are a ‘made-for-each-other couple’. Tell us in your own words. He: Even though we got married without matching our horoscopes, when we checked them much later, the pandit told us that 29 qualities out of 36 were well matched (laughs). She: As you may be aware, this is considered to be very lucky. He: What I really like about her is her ability to adjust. I have never known her to be negative about anything. She: I like the fact that he always takes my opinion into consideration. He does have a short temper, but he cools down very easily. He likes to argue, but eventually he will heed my suggestions. He: She easily adjusted into my family with her smiling nature which is something she seems to be gifted with. J&P: That’s so true. Tell us Neetaji, how do you manage to keep this palatial house so elegant and beautiful, and yet look so calm and composed at all times? She: Thank you (smiles). I think I am a lot like my father. He was a very simple and calm person. I have never ever seen him get angry. He: I don’t ever remember her uttering a harsh word. However angry I may get, she will just smile serenely. Nothing can have a more calming effect. J&P: The secret for living happily in a joint family? She: Living in a joint family requires a give and take attitude and the capacity to sacrifice. It is necessary for a couple to respect each other and have mutual trust. Most problems happen because we don’t let go of our ego and try to dominate. He: I think her secret also lies in her cooking and food presentation. I always admire the way she and Anju (younger brother Rajendra’s wife) present every single dish. J&P: So food is the way to the heart. What are your favourite preparations? He: I enjoy her south Indian dishes and also her continental and Chinese fare. Her puddings and sandesh are quite famous. But if there is one dish that all our guests enjoy, it is the dal in our meals. J&P: Home food or eating out? She: He loves home meals but I enjoy eating out once in a while. He: And I am happy enough going along with her. Photo Courtesy: Pic 1, 4 & 5 by Manasvi, Pic 2 & 3 from Lodha archives. First published in January 2012 in Harmony – Celebrate Age Magazine for the column – Soul Food and Soul Mates. Part-2 of this post is the Rajasthani Specialty Aloo Pyaaz Subzi and Tikkad from the kitchen of Neeta & Sumthimal Lodha – the 7th couple featured in this column.